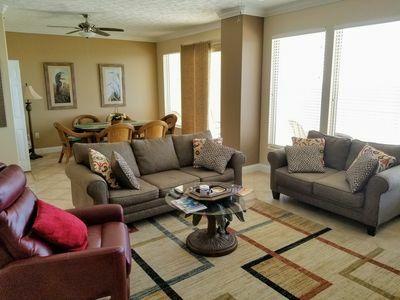 Enjoy a relaxing Panama City Beach retreat when you stay at this upscale 3-bedroom, 3-bath condo located steps from the beach in Sterling Breeze Resort. 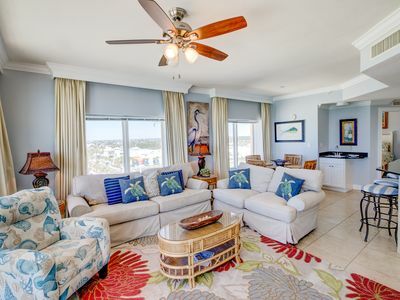 With complimentary, seasonal beach chair service, flat-screen Smart TVs in every room and a prime beachfront location, this lavish 22nd floor condo ensures a memorable getaway for your next family vacation. Take a short walk to Pier Park and enjoy great shopping, dining and the new outdoor amphitheater with free concerts all summer long! 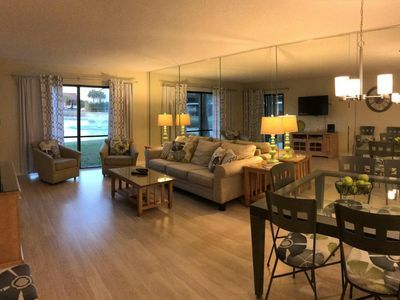 Sterling Breeze is a luxurious oceanfront resort with only 145 suites, perfect for snowbirds seeking their next family vacation. 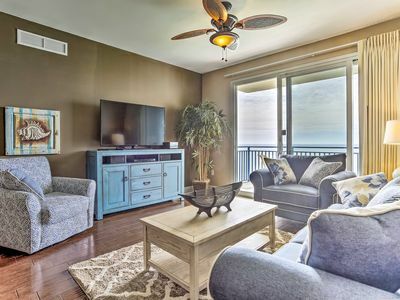 This updated condo is situated on the 22nd floor of the complex and offers over 1,440 square feet with 9-foot ceilings and upgraded wood tile floor throughout. 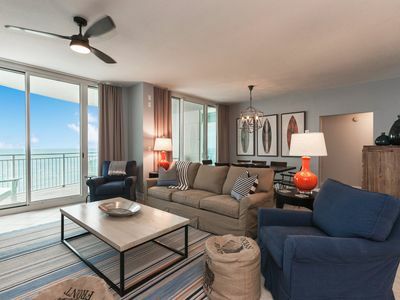 Step inside to find your very own tropical getaway boasting gorgeous gulf front views! 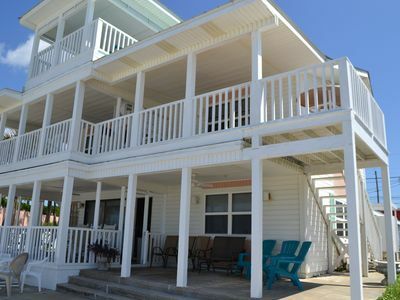 Enjoy your morning coffee on the large balcony as you watch waves cascade onto the sandy shore. 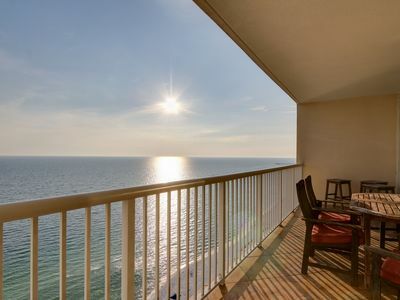 The terrace balcony also features an electric grill, perfect for cookouts with ocean views! While the steaks are sizzling on the grill, prepare a few sides in the fully equipped kitchen with granite countertops. Enjoy your meal around the dining table while you relax with a movie on the Samsung flat-screen Smart cable TV with Netflix, Amazon, Hulu, and more . 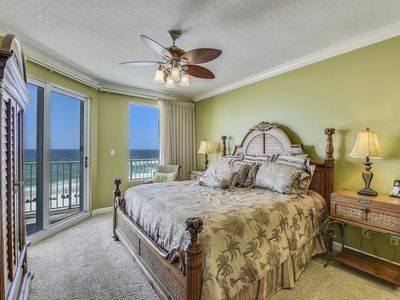 Wake up feeling rejuvenated after a good night's sleep on the king-sized bed in the master bedroom. 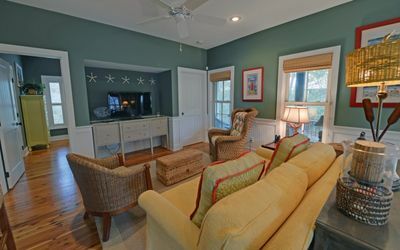 Open up the sliding glass doors to fill your room with the warm, salty ocean breeze, before rinsing off in the elegant walk-in shower. 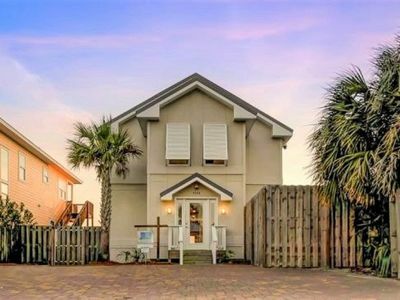 Spend your day exploring Panama City Beach or take advantage of the great community amenities including the 2,000 square foot heated pool, hot tub, community activity room, covered garage parking, state-of-the-art fitness center, wine bar, and the fire pit. 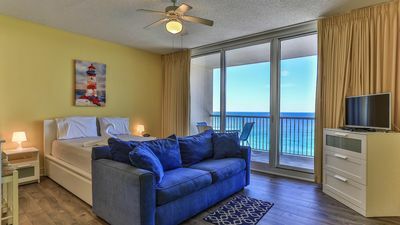 This condo also comes with complimentary VIP beach chair service (a savings of $350 weekly for guests), allowing you to enjoy luxurious beach chair service with umbrellas for 2 adults while relaxing by the sandy shores! 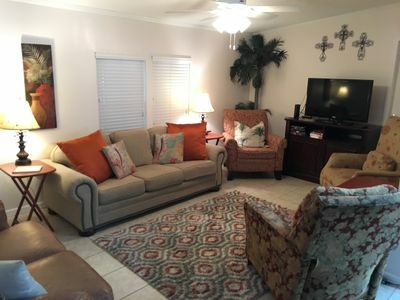 Just steps from the beach, this condo allows easy access to walks along the Gulf shores and refreshing swims in ocean waters. You'll love having immediate access to a variety of water activities like boating, jet skiing, and snorkeling. 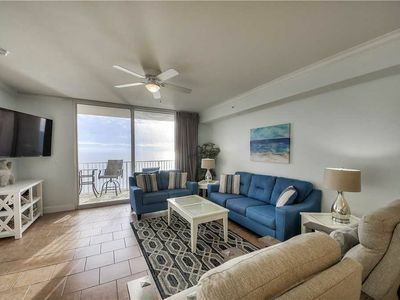 Located a short walk from Pier Park, this condo places you seconds from amazing shopping, dining, and a variety of entertainment. The newly built outdoor amphitheater offers free concerts all summer long, perfect for enjoying live music! You'll also find an amusement area with rides great for kids and adults alike. 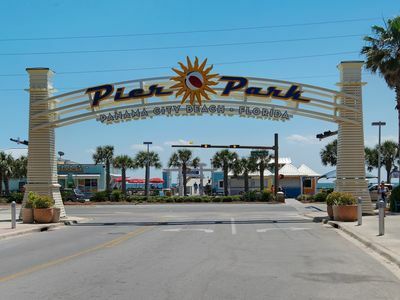 Whenever you're not cooking your own meal at the condo, you'll find plenty of dining options to choose from at Pier Park. Enjoy tasty restaurants like Jimmy Buffett's Margaritaville, the Back Porch, Reggae J's, Buffalo Wild Wings, Guglielmo's Italian Grill and more! Shop at unique stores like Ron Jon Surf Shop, Shimmering Sands and Paradise Found, or favorites like Sunglass Hut, Borders, Dillard's and Old Navy. 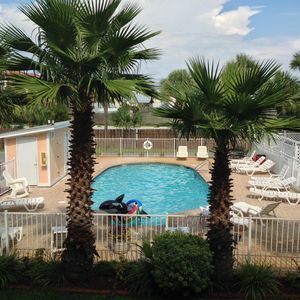 For water slides, wave pools, and outdoor fun, Shipwreck Island Waterpark is just 3 miles from the property. Kids will love spending a day at WonderWorks, a favorite attraction with 100+ hands-on science exhibits, a ropes course, and 6D motion ride. Discover Gulf World Marine Park where you’ll get to swim with dolphins, talk with parrots, and see sea turtles in their natural habitat. 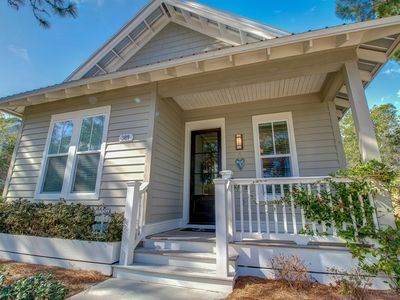 Mercado 4A - Overlooks Rosemary Beach Square - Elegance and Convenience! 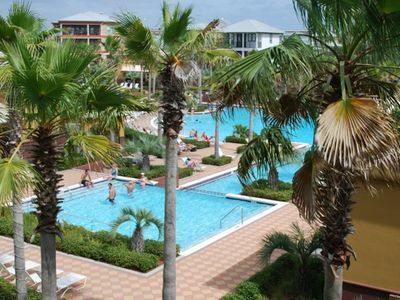 3 Bedroom/ 3 Bath Calypso West End Unit!! 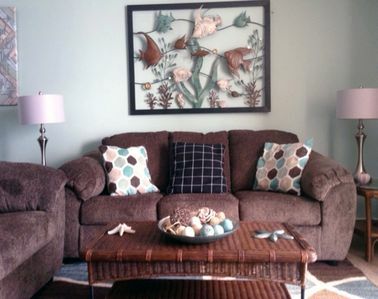 ... Remodeled This YEAR!! 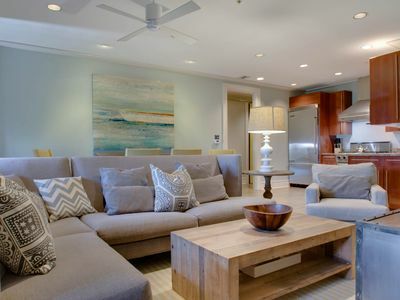 AQUA 1002 LUXURY CONDO - NEWLY REMODELED! BEACH CHAIRS! BREATHTAKING VIEWS! 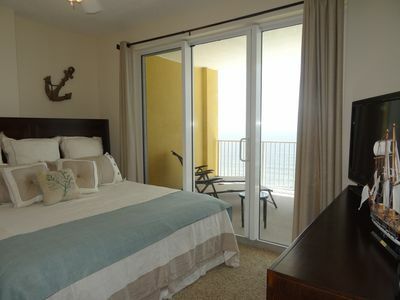 Marisol 202-3BR/Sleeps 8~BEACHFRONT w/ Balcony & Jacuzzi Tub~Great Amenities! 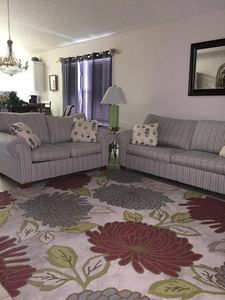 Gulf Front- All Tiled - Super Clean - Beach Service Included!